Virtually all boats are developments or extrapolations of previous designs. With the advent of computer-aided design for boats and ships, there is a desire to recreate many of these tried-and-true designs as 3-dimensional surface models to use as references or starting shapes. For others, however, the goal is to recreate a classic design on the computer for study purposes or to build a replica of the vessel. 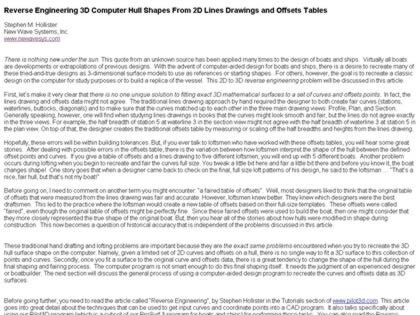 This 2D to 3D reverse engineering problem will be discussed in this article. Stephen M. Hollister. Web Site Snapshot: If available, above is a snapshot of the Reverse Engineering 3D Computer Hull Shapes From 2D Lines and Offsets web site at http://www.newavesys.com/HullReverseEngineering.htm as it appeared when this site was added to the directory or last verified. Please Note that Boat Design Net has no involvement with the above web site; all content and images depicted in the above thumbnail are the property and copyright of Reverse Engineering 3D Computer Hull Shapes From 2D Lines and Offsets unless otherwise noted on that site. Description: Virtually all boats are developments or extrapolations of previous designs. With the advent of computer-aided design for boats and ships, there is a desire to recreate many of these tried-and-true designs as 3-dimensional surface models to use as references or starting shapes. For others, however, the goal is to recreate a classic design on the computer for study purposes or to build a replica of the vessel. This 2D to 3D reverse engineering problem will be discussed in this article. Stephen M. Hollister.